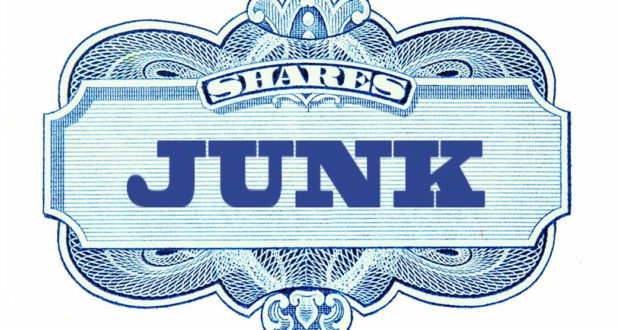 Much has been written lately about junk bonds and how they are overvalued. Type “junk bond news” into a search engine and you will see what I mean. I did this earlier and saw articles from Barron’s, Bloomberg and The Financial Times, and all three had been published in the previous 24 hours. Go back a month, and you will find hundreds of articles on the subject of junk bonds and how they are overvalued or overly loved by investors. Looking at the monthly chart of the iShares iBoxx High Yield Corporate Bond ETF (NYSE: HYG) as a proxy for the U.S. high-yield bond market, we see that the fund is overbought based on the 10-month RSI. In fact, the RSI is at approximately the same level it was at in March ’13 and May ’14. Neither of those instances was a good predictor of a significant decline in the HYG. The reading in 2013 to precede a small decline, but after the 2014 reading, it took over a year for the fund to decline significantly. The fund has gained 50 percent since November ’11 and has only had two pullbacks greater than 10 percent in the last seven years, so the attention may be warranted. It is also a concern considering all of the talk of rate hikes by the various central banks around the world. When interest rates on government backed bonds start rising, it takes a greater yield on junk bonds to attract investors, and that means the price of the bonds would have to fall. 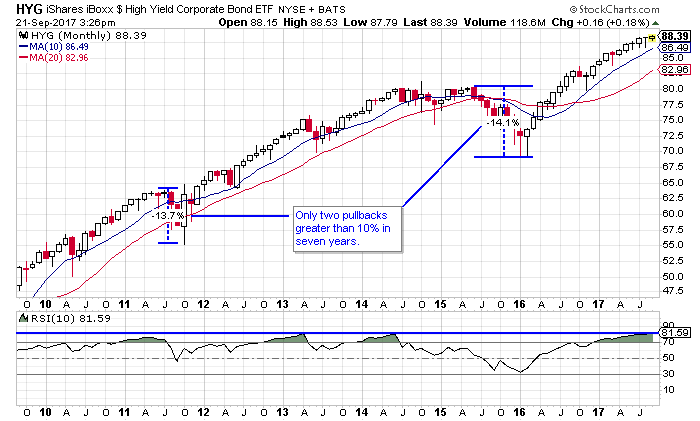 From a technical perspective, we know junk bonds, in general, are overbought. From a fundamental perspective we know the risk of buying them in a rising interest rate environment, but what about the sentiment toward junk bonds. 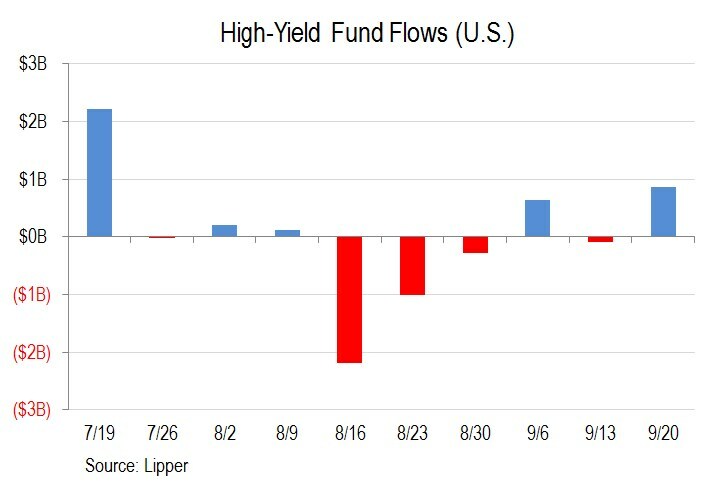 Looking at the fund flows from Lipper, we see that there was an inflow of funds into high-yield funds in the most recently reported week. In the chart below we see that there were considerable outflows in August, but that had little impact on the price of the HYG. Again we are using the HYG as a proxy for the junk bond environment. Even after the inflows of the past week, there have still been net outflows for 2017 as a whole, and yet the price of the HYG has continued to climb. What this suggests is that the sentiment toward junk bonds is more pessimistic than optimistic and it is rare that we see a downward reversal when pessimism exceeds optimism. One other factor I looked at was the Sentimentrader.com reading toward the HYG. Sentimentrader has a composite sentiment reading that looks at things like put activity compared to call activity, future volatility expectations, price compared to NAV and price behavior. They call it the optix. The optix for the HYG is at 32 as of September 21. The optix can range from 0 to 100 and in the case of the HYG it has been as high as 80 in the past year and as low as 5 in the past year. A higher optix reading is indicative of excessive optimism while a lower one is indicative of excessive pessimism. So with a reading of 32, it isn’t showing excessive sentiment in either direction, but it shows slightly more pessimism than optimism. In all you have the technical analysis showing that the HYG is overbought, the fundamentals are somewhat worrisome, but only because of what is expected to happen, not because of what is actually happening. The sentiment is leaning toward too much pessimism which is a good thing from a contrarian point of view. When you add all of this information up, we may see a correction in junk bonds in the future, but I wouldn’t count on it starting anytime soon.